The final novel from Dunmore, who passed away in 2017, explores the impact of the French Revolution on 1790s England within the context of a gothic romance. The novel, which is animated by a current of gothic horror, depicts the social ferment, the ideological passion, and, ultimately, the smashed visions of the late eighteenth century; it is rich in details of material life — and death; and it powerfully conveys the emotional urgency of its characters. We feel that the lives of these fictional beings are just as real as those of actual people whose ideas and exertions contributed to the tenor of those times, lives that are lost to us now in the murk of the past. We feel, too, Dunmore’s deepened awareness of this and believe she did indeed have an intimation at some level that she, at least in body and mind, would soon be part of the past. Her finest books, among them The Siege, her last one, Exposure, and this one will, I hope, keep both her memory and those of her characters alive for as long as people read novels. Lizzie Fawkes is a naïve young woman, but she’s not a naïve narrator. There’s no device or subtext to her story. Birdcage Walk is not a novel in the form of a diary, a memoir, a letter or an internal monologue; Lizzie’s voice comes out of the air. Occasionally, and for no apparent reason, she slips into the present tense. 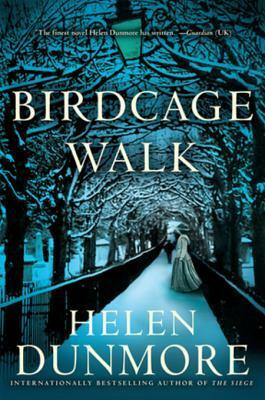 In this and other ways, Birdcage Walk defies and includes a number of genres; it steadfastly refuses to be one thing. And why should it? Why narrow the scope of what a novel can do? The plot meanders, surprises. The characters are thoughtful, complex and irritating; sometimes they just talk about ideas. Helen Dunmore died in June of cancer. Increasingly ill as she worked on this book, she observes in its afterword that 'under such a growing shadow,' the novel 'cannot help being full of a sharper light, rather as a landscape becomes brilliantly distinct in the last sunlight before a storm.' That sharp light illuminates the canvas of Birdcage Walk and gives it a charged radiance. It has a tenuous, momentary feel, as if one were reading a Turner painting. The storm will blot it out. Dunmore is a lovely and deceptively understated writer, able to evoke passion and rage with ease and elegance. Her prose is restrained and thoughtful, and Elizabeth and Diner and even scrappy Philo, the servant girl, feel authentic and vivid, brought to life with just a few strokes ... In the tradition of Rebecca West, Dunmore is skilled at claiming the huge canvasses of history and painting upon them exquisitely detailed human tragedies ... The Revolution powers this novel but it is a huge, low thrumming invisible engine beneath it, and the consequences that concern and engage us are the private, the personal. Every scene is saturated with vivid period detail but Dunmore’s touch is feather-light, and the result makes for a satisfying and deceptively easy read. What did you think of Birdcage Walk?